Bailieborough News. October 12th 2017. Bailieborough News. October 12th 2017. Matthew J. Cullen. Sincere thanks to all who supported Bailieborough Poetry Festival events last weekend. The success of this festival has been made possible by those of you who attended in such large numbers. A special word of thanks to Fiona Burke and all the staff of Bailieborough library whose assistance has been invaluable also to Peter Murtagh for his continued generosity in providing us with a wonderful venue. Congratulations to Bailieborough’s own ‘Hardtimes Chorus’ who were the winners of the Bailieborough Shamrocks ‘Lip Sync Battle’ held in the Killinkere Leisure Centre on Saturday night last. Well done also to all the other acts who contributed to such a brilliant show and well done to the hard working committee from Bailieborough Shamrocks on hosting such a terrific event. Congratulations to the following students from Bailieborough Community School who received their John Paul II Award from Bishop Leo O’Reilly at a special presentation ceremony in the Cavan Crystal Hotel: Amy Smyth, Kirsten Lokko, David Kivlehan, Sean Halton, Danny Halpin, Andrea Arellano, Grace Denning, Lucy O’Neill, Chloe Hogan, Calum Gorham, Smilte Kazlaite, Kevin Molloy, Ronan Moore, Kate McKenna, Aiden O’Connell, Conor Proudfoot, Padraig Reilly, Adrian Smith and Enda Traynor. This month’s ‘Open Door Sessions’ will take place on Friday, October 20th in Nixys, The Square Bar (downstairs), commencing at 9.00pm. The artists taking part this month are: ‘Wayfarer’—Folk Band, Liz O’Hanlon—Drama and Ronan Leonard—singer/songwriter. All welcome for a great night’s entertainment. Deepest Sympathy is extended to son Malachy, mother Tish, father Martin, brother Adam, Sally-Ann, step children, Justin, Roxanne , Harrison, grandchildren and extended family and his biker friends on the death of Clark Duffy, formerly of Laytown, Co Meath and Bailieborough, Co Cavan who died on Monday, 25th Sept 2017 following a motor cycle accident. Clark’s Funeral Service took place on Friday, September 29th with cremation afterwards in Lakelands Crematorium, Cavan. Deepest Sympathy is extended to partner Esko, mother Ita, father Paddy, brother Rory, sister Mary, sister-in-law Geraldine, brother-in-law Brian, nieces Maria, Lily and Eve, nephew Tom and extended family and friends on the death of Piaras Clarke Sario, Phibsboro, Dublin and late of Kells Road, Bailieborough, Co. Cavan, who passed away peacefully, at St Francis Hospice, Blanchardstown on Sunday, October 1st. Piaras’s Funeral Mass took place in St. Annes Chapel on Tuesday morning, October 3rd followed by cremation in Lakeland Crematorium, Cavan. Baptism Dates in St. Annes for October and November 2017: The following are the available dates for Baptisms in St. Anne’s Church–October 14th (Saturday, 1.30pm), October 22nd (Sunday, 12.0pm), November 11th (Saturday 1.30pm) and November 26th (Sunday 12.30pm). FREE Irish Classes, starting at the Library on Tuesday, October 17th at 2pm. This course is accredited and facilitated by a qualified tutor. Places are limited and may be subject to conditions. Phone 042 9665779 for enquiries. The Annual Harvest Thanksgiving will take place at the Saturday and Sunday Masses next weekend October 14th and 15th. If you have any produce, that you would like displayed, please contact, Marie Guckian or Geraldine Reilly. A Public Meeting on ‘Let’s Stop Rural Crime’ will take place in the Hotel Bailie on Monday evening next, October 16th, commencing at 7.30pm. This meeting will be hosted by local T.D., Niamh Smyth, with guest speaker, Jim O’Callaghan, Fianna Fail Spokesperson on Justice and Equality. All are most welcome to attend. Located at the Beckscourt Centre, the Men’s Shed is an excellent outlet for men to get together, enjoy their time, have a chat and learn new skills. All are welcome. Anyone interested or needing further details, please call into the Centre or call: 042 9694825. The launch night for the ’32 County Honda Challenge’ will take place in Kangley’s Bar on Saturday next, October 14th, commencing at 9.30pm. This event hopes to raise funds for Bumbleance—The Children’s National Ambulance Service. On Thursday, October 26th, 32 Honda 50’s will leave from Kangleys at 9.00am and over the following 5 days, they hope to travel through the 32 counties, raising funds for the Childrens Ambulance Service. All are welcome to the Launch Night, where music will be provided and a raffle will also take place. Lotto results for 30/09/17. Numbers Drawn; 1, 2, 10, 23. No Jackpot Winner, Lucky Dip (€25) Winners; Mairead Donnellan, Leitrim; Peter Brady; Thomas Cunningham, Tattyreagh; Patsy Clarke, Cross. Lotto results for 7/10/17. Numbers Drawn; 3, 8, 19, 22. No Jackpot Winner, Lucky Dip (€25) Winners; Oisin Sheridan, Cloverhill; Marion Carolan, Lisgrey Gardens; Brendan and Collette Gavin, Rakeevan; Philip Sheridan, Galboly. Jackpot next week, €1,800. Huge congratulations to local man, Killian Heery who was crowned The National Adventure Race Champion 2017 after his win in the Quest Adventure Race in Killarney on Saturday last. With wins in Dingle, Moxie and Achill Adventure Races, already this year, Killian wins his second National in 2017 along with the Triathlon Ireland Duathlon Series. East Cavan Gaels are currently recruiting minor and adult players to join their Club, to enter into competitions for the first time, starting with a new 9-a-side league. All adults/minors from the entire region i.e. Bailieborough, Shercock, Killann, Knockbride, Killinkere, Mullagh areas, who wish to join us are invited to come along. Beginners Class: We have Computers for beginners taking place in Bailieborough Business Centre, course is free. Phone: 042-96 94 716 or 086-794-9739 to reserve your place. On Sunday next, October 15th, the Annual Mountain Lodge ‘Tractor Run’ will take place. All tractors—old or new and all vintage cars are welcome. Proceeds in aid of the Children’s Ward in Cavan General Hospital. For further details, please contact Samuel on 086 822 6879 or Aidan at 086 386 1103. Hardtimes Chorus will present “Thank You for the Music” a wonderful concert in aid of St Anne’s Church Renovation Project. Tickets are now available in St Anne’s Parish Office (Curate’s House), Virginia Road on Mondays from 10.30am to 3.30pm, Thursday’s from 10.00am to 3.30pm and Fridays from 2.00pm to 6.00pm, Super Valu, Bailie Stores and the Bailie Hotel. Tickets will also be available after weekend Masses from October 8th. Your support would be much appreciated. The Show date is Friday 10th November 2017 at 8 pm in St Anne’s Church. Admission €15.00. Social Dancing: Our monthly dance takes place in the Community Centre on Saturday next, 14th of October. Music is by J & S Sound. This group is well known for its soft melodious music and has a big following. It should be a great night. Supper to refresh you will be provided. All welcome. Cavan Birdwatch: Cavan Birdwatch outing to the Sligo coast on Sunday 22nd of October to see Barnacle Geese and winter migrants. Meet in Cartron car park, Sligo town, at 11.00 a.m. All are welcome. Contact cavanbirdwatching@gmail.com or 087 7735487 for more information. Bailieborough Community Indoor Bowls: Bailieborough Community Indoor Bowls take place every Tuesday evening in the Community Centre, Chapel Road at 8.00pm. New members are always most welcome. Baby and Toddler Group: Bailieborough Library Baby and Toddler Group starts back every Wednesday at the earlier time of 10am. All babies, toddlers, parents and minders are welcome. No charge. Irish Dance Classes: Irish Dance Classes with World Champion Dancers, Aishling and Emma Fox takes place in Tierworker Hall on Wednesday and Friday evenings. All levels welcome. For more information, please contact: 087 205 9128 or 087 969 9235. 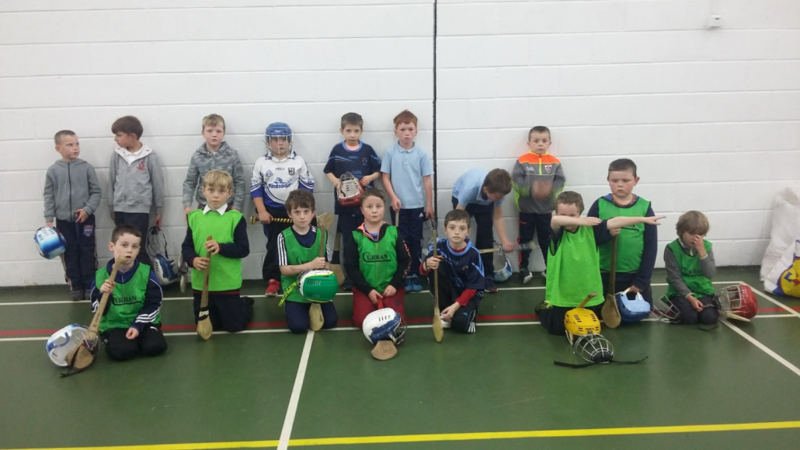 Indoor hurling is now fully back up and running in both Kingscourt on Thursdays and Bailieborough on Fridays. It has been one of the best new starts in many years with lots of new players joining the fun. Let’s keep up the good work. New players always welcome. Equipment supplied. Under 12/13; Floodlight failure coupled with horrendous weather conditions put paid to the first round of the U13 which is now going to start this coming Wednesday on the 3G. Fermanagh, Longford and Cavan teams will make for a good evenings hurling. 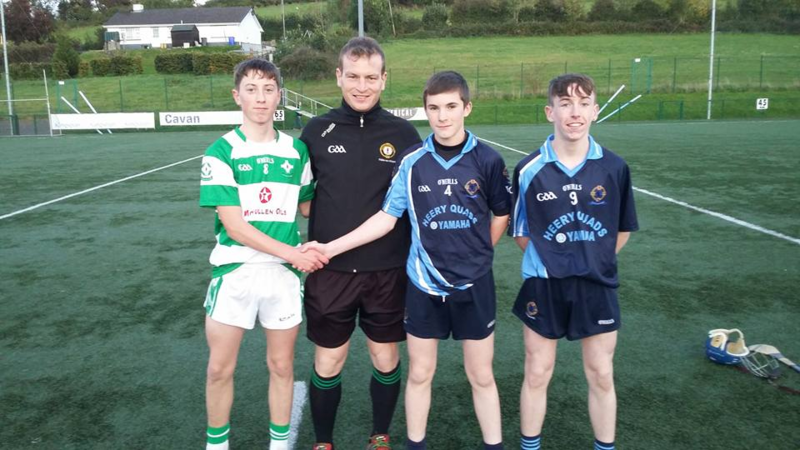 Under 14; Commiserations to our U14s in the Championship Final on Monday last. A solid first half performance was undone by a physically more powerful Cootehill side. ECG joint captains Conor and Colin. Mondays U14 championship final squad. Under 16; The Ballymachugh tournament has been postponed to a later date. Adult and Minor; We have entered into the Cavan 9 a side adult league beginning in November on the 3G. This will be our first ever taste of adult hurling in the club and will act as preparation for a full 15 a side team in 2018. Training for all adult and minor players will be on Sunday mornings in Kingscourt Stars GAA grounds at 11am sharp. Wednesday; U13 Breffni 3G 7pm. 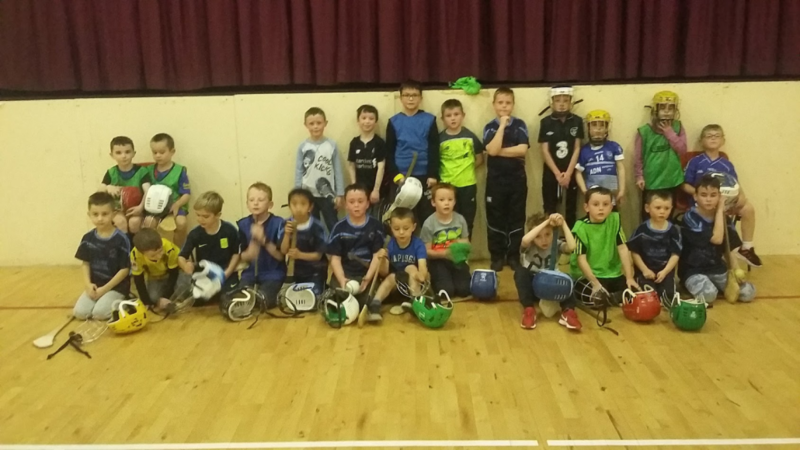 Thursday; .Kingscourt indoors in the Community Centre U6/8/10 at 6.45. 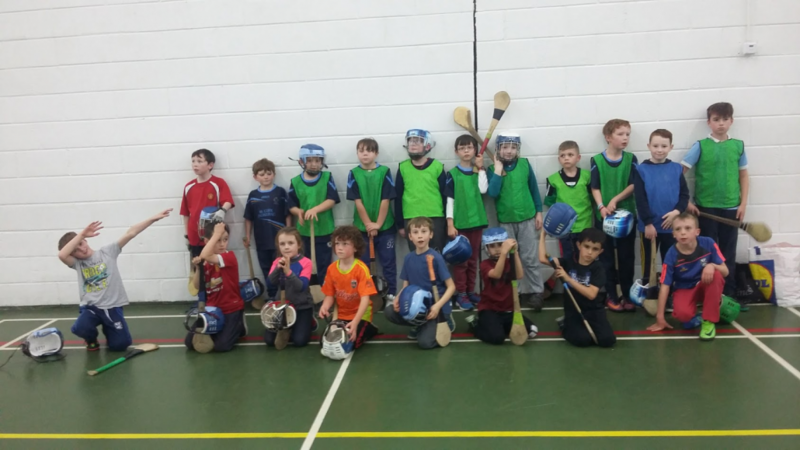 Friday; Bailieborough indoors at the BCS sports hall U6/8 6-7. U10 7-8. Sunday; Adult and minor training 11am in Kingscourt Stars GAA grounds. In aid of St Christopher’s Hospice Cavan takes place on Saturday 28th October 2017. This event will start and finish at McSeains Bar, Cornafean and will be marked out and stewarded along the route to guide you along the way to whichever distance you decide to participate in. Main sponsors are MacManus Pharmacies Cavan, O’Neill’s Pub and Shop in Redhills and Garry Smith from Smith’s Catering in Ballyconnell. Over the previous 13 years the Challenge has been an outstanding success raising €367,000 for this wonderful cause. There will be loads of surprises and craic on the day and it will be a fantastic day for the family. Entry fee on the day to participate in the Challenge is voluntary. Anyone wishing to donate to this very worthy cause can do so by leaving donations in the Village Foodstore, Crossdoney. All donations are greatly accepted. Sponsorship cards are available from St Christopher’s Hospice 049-4332999, Ciaran Weir 086-0753309, William Hughes on 086-3584700 and Village Foodstore in Crossdoney. Please COME ALONG and support this worthy cause!! Get Ready, Get Steady, Go : Have you taken time out to look after family or raise children? Would you like to meet new people and boost your confidence? Are you thinking about returning to work? If so then a new programme from Cavan /Monaghan Education and Training Board could be for you. This project is supported by the Irish Government and the European Social Fund (ESF) as part of the programme for Employability, Inclusion and Learning (PEIL) 2014-2020.
http://bailieborough.com/wp-content/uploads/2015/09/bborocomlogo2015-300x130.png 0 0 Colette http://bailieborough.com/wp-content/uploads/2015/09/bborocomlogo2015-300x130.png Colette2017-10-12 12:24:062017-10-12 12:47:21Bailieborough News. October 12th 2017.